A survey recently released by the Institute for Building Efficiency shows that while interest in energy efficiency is increasing among building owners, energy cost savings remain the driving factor behind organizational energy efficiency decisions. Figure 1. 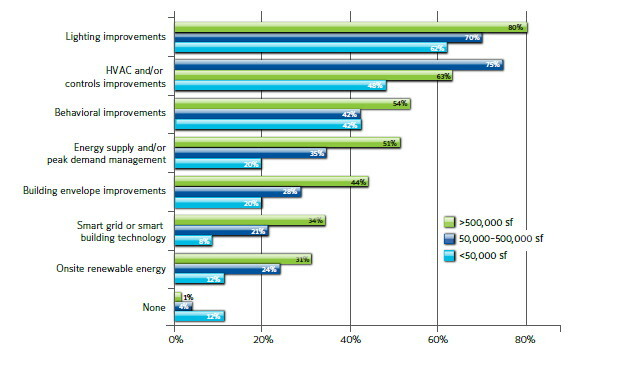 Which of the following energy efficiency measures has your company/organization adopted in the last 12 months? North America building owners expect lighting and smart building technology to play major role in the future. Rising energy costs are clearly expected by building owners. 80% of the respondents expect double-digit energy price increases over the next year. As a result, owners have set an average energy reduction target of 12 percent. The most significant obstacles to meeting these ambitious goals are access to funding and financial returns. Barriers to capital access topped the list for respondents in the U.S./Canada (38%) and Europe (30%).